In April Ireland will celebrate the 100th anniversary of the Easter 1916 Rising to end British rule and the proclamation of Ireland as a republic. 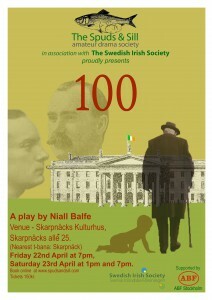 To mark this milestone please join us for Niall Balfe’s new play, 100. Booking is open now and we expect great interest in this unique cultural event. Members of the Swedish Irish Society will be informed of their discount code in the email newsletter. It is the 24th April, 2016. The President of Ireland is coming to call on Sean Boland on the occasion of Sean’s 100th birthday. At the same time, Sean’s grandson, Al, is about to launch a war on a rival drugs gang. Meanwhile, back in 1916, Sean’s father, Pat, has been called out by the Irish Volunteers as they make a bold strike for freedom from British rule, while his uncle is away in the trenches in France fighting against the Germans. With Ireland and Europe in turmoil, Sean’s mother Nellie is going into labour. “100” is a brief retrospective of Irish history since the great Easter Rising of 1916 as seen through the lives of one family. Is this “the house” that Pearse “shaped in his heart”?